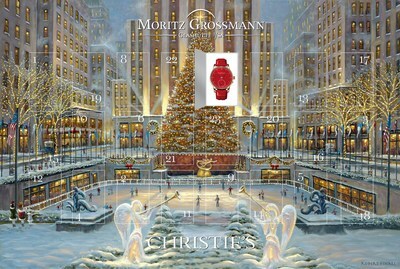 As a symbol for the 24 watches and in keeping with the Christmas spirit, Moritz Grossmann have created an interactive, online ADVENT CALENDER https://www.grossmann-uhren.com/xmas/ where all 24 unique pieces can be viewed. This will allow visitors to view each piece in detail before being directed to the CHRISTIE’S WEBSITE where they can place a bid https://bit.ly/2FEVEwc. In a celebration of New York, where Christie’s is based, the watches will sit behind the interactive ‘windows’ of the Rockefeller Centre, the snowy scene is completed by ice skaters and a beautiful Christmas tree.